Inspired no doubt by my pathbreaking and/or monumental 2009 survey of the country, researchers increasingly are producing informative quantitative analyses of various aspects of Bahraini politics and society. Recently I highlighted a Columbia grad student's social network analysis of Bahraini opposition and media networks. Now several additional projects have come online, and still others are in the works. One is a more interactive, Google-enabled version of my study of electoral gerrymandering by the people at Bahrain Watch. (Yes, I understand the political views of the group, but that doesn't mean its analysis in this case--based on public election data--is somehow biased or to be avoided or ignored.) The results are represented in the two maps above, which reveal the discrepancies in electoral representation across Bahrain's 40 districts, and how these serve to systematically under-represent constituents in opposition-dominated (in practice, more Shi'a-populated) districts. 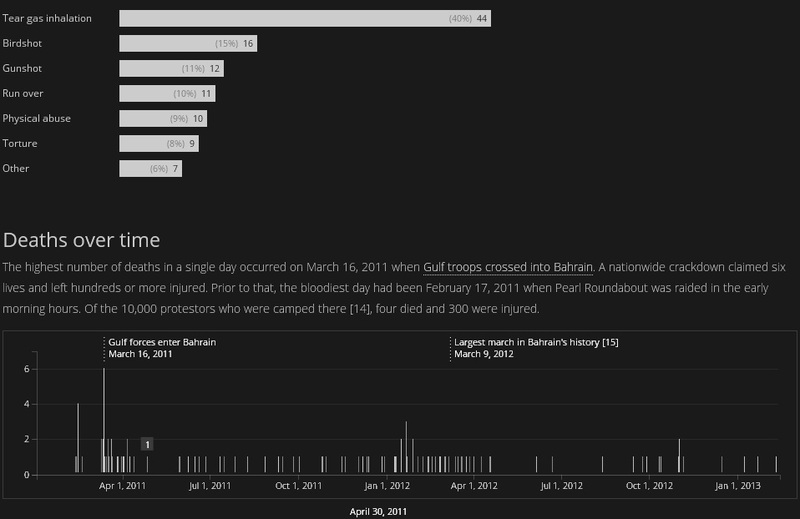 A second study that just came to my attention is a website by one 'Ali al-Mussawi called Bahrain Visualized, which presents an interactive chart depicting the deaths of Bahraini citizens since the beginning of the uprising. (Again, before someone writes in to ask, "Where are the police deaths!??! !111one," I appreciate that the data are not being employed for non-partisan purposes, but that doesn't mean that they aren't still useful or original.) This is particularly relevant with the news today that anniversary clashes between protesters and police have resulted in the death of one 16 year-old boy. 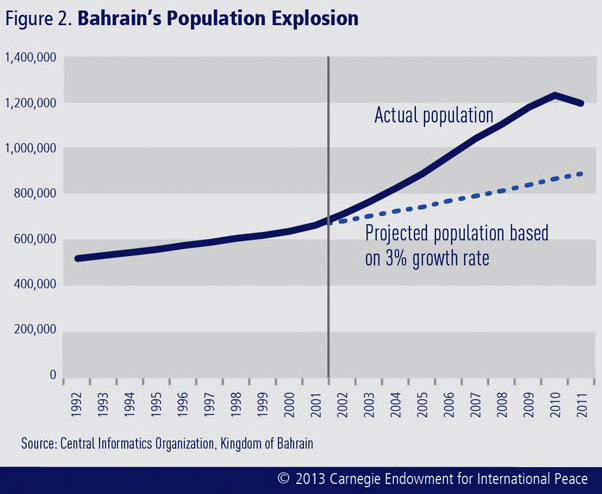 So, again, it's good to see this increased application of more empirical-based methods to the Bahrain and larger Gulf context. Update 2: More attempts to play spoiler: attacks on police and a (diffused) bomb on the Saudi causeway. Update 3: Riddle: if a country uncovers dozens of fake Iranian-backed terrorist cells, how do you know when it actually uncovers an Iranian-backed terrorist cell? Thanks; I'll add this when I get a second.